Your Invitation to the International Crystal Skull Network & How to Sign Up!! On March 12th, 2011, in Maarssen, the Netherlands, there was a special crystal skull conference held which was co-created by a group of various individuals living in the Netherlands and the United States. This conference came together amazingly quickly which included a group of international speakers and Dutch speakers who were invited and accepted to be a part of this wondrous event. The organizers for this crystal skull conference who spontaneously came together, had never all worked together before. But the conference was highly successful because each participant whether it was an organizer, speaker, performer or a person who was in attendance, each person offered their unique part and service so we could all celebrate what the crystal skulls are truly about. This event featured an open sharing of the speaker's knowledge and wisdom with special meditations and performances. For those of us who are co-sponsoring the new network we are presenting, we each believe the crystal skulls have always represented to humanity for over thousands upon thousands of years, a sacred artifact or tool which contains universal knowledge and wisdom and special frequencies of energies to assist humanity to evolve into a higher state of awareness and being. The message of the crystal skulls is about peace, unity and cooperation for the benefit of all living beings on our world and for the “Mother Earth” herself. Now of course this is not a new concept by any means. Many people have had this idea or have thought about it before. But as of yet, it has not been fully developed as this is no simple task to do. 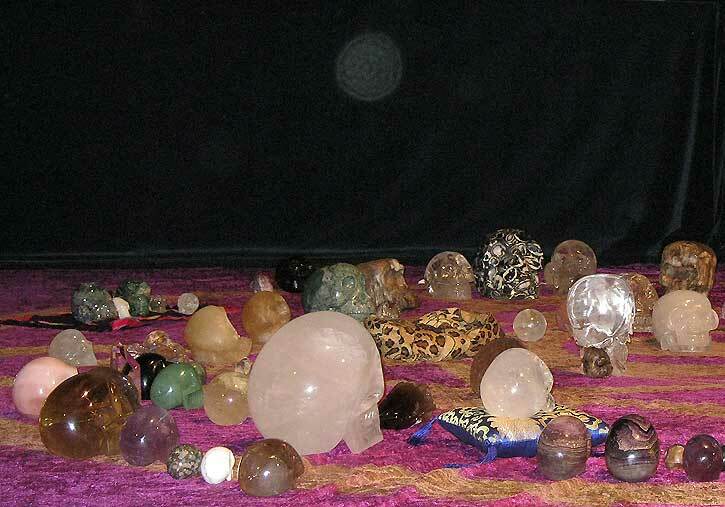 However, the energy of the Dutch conference (“The Unfolding of the Crystal Skulls, Dutch Edition #1”) acted as a catalyst to clearly show that it is very possible when people work together in total cooperation and respect for each other, (regardless of differences of theories and ideas what the crystal skulls represent or who may have originally created or brought them) that a harmonious crystal skull event will prevail and happen. As this is the energy and message of the crystal skulls, is it not? So now it is time to go to the next step which is what we (the Crystal Skull Explorers) are offering to you now. or just an individual or group interested in the study of the crystal skulls. There are no conditions for a person to join as this network will not be involved in taking any sides about the validity of whom a member is or what information they share about the crystal skulls. The only rule we will have, if there is such a rule, is that since the crystal skulls offer an example/message about peace and acceptance of others – one member may not be judgmental, critical or openly attack another. It is natural in the course of human events that people will have different opinions and ideas that will not always agree with others. But the beauty of this network is that everyone is equal and has a chance to present their views freely!! The more views that are presented by our members, the better it is as it provides an opportunity for all our members to decide which view, idea or theory feels the best for them. The goal of ISCN is not to replace in any way any existing crystal skull groups, organizations or social networks which are also providing a powerful way for people to meet and share their ideas and experiences. It is our hope that such groups and networks will embrace the impartiality of this new organization and will support it. There are many people today who are connected or feel a strong affinity for the crystal skulls that believe their existence (including the public revealing of many of the older skulls that is happening within the last few years) is for a beneficial and peaceful reason to assist humanity into a new world of harmony and beauty. We consider an even higher purpose that ICSN will offer is providing a meeting place where members of the network can help each other on projects or activities of mutual interest or that we can collectively co-create new events and activities that will greatly benefit our world and the crystal skull community in general. For example, if there are special conferences or events, the network can provide assistance to support these projects. The key principle which exists, of course, throughout life and everywhere in the universe is the idea of giving and receiving – which forms a perfectly balanced system. That is at certain times one of our members will receive great assistance with their personal project and then at another time this member then supports the dream or vision of another. Each member has a choice which events or activities linked to individual members they will help and support. Can you imagine what might happen when we all begin to work together? Further we acknowledge that every person or group who might decide to join ICSN has their own unique skill and knowledge which is special and can benefit other members and visa versa. Now another question which might come into the mind of a potential person or organization – is how will the network be run and organized. It is our vision that there will be a rotating council of individuals (perhaps 3-5) who will oversee the direction of the network and handle requests and questions from the members. This council will change every year or two and a new group will come in. This is very important because the network will not and can not be controlled by the voice of any single individual or group – ICSN must maintain neutrally and only be directly involved with individual members if there are is some disagreements or problems. Membership at this initial time will be free. In order to join, we have an online form you can fill in (Note: see the button below to go to the member signup form webpage). As soon as the network is ready for full operations we will contact you. We will initially offer an open discussion mailing list so members can begin to communicate with each other and get to know each other. Also this will be a way for ICSN to share announcements to the members. But as we build the support structure of the network, we will offer more services. We believe as people join, some of you will want to help with the building of ICSN and will have new ideas which can be implemented to enhance the network. The initiating group known as the Crystal Skull Explorers for example, has a free newsletter they offer which will be available to all of our members once we get started. If any of our other members wish to offer some free service or products, all you have to do is contact us and we can discuss it offline. For any members who have a crystal skull related event they are doing or other type of similar activities they wish to announce this will also be possible and permissible through the mailing list. Or if you are seeking some type of additional help to create your own crystal skull project, it will also be possible to share this with our network and ask for such help. Once the network is officially formed, we will have our own website and services to offer. At this time, we hope to have these services online by the middle – late part of this year (2011). As with any new organization, how quickly it grows is directly related to the enthusiasm and help of the membership. It was also proposed by “Spirit” when the idea for ICSN was received that the best way for the network to grow initially is for our members to personally invite others they know. That you can invite any Friends, Family or Associates who you feel have in their heart a strong connection with the crystal skulls and are very dedicated and excited to be involved with other people and projects linked with the same. As we have more and more people who join us, and each member becomes their own co-creator within this network, it will evolve and grow in ways we can yet to imagine. Think about what we can accomplish as we each share our special talent, skill and knowledge? Are you as excited as we are? If you have any questions at all about ICSN, please feel to contact us. We have two emails below, one for our English speaking members and another email for our Dutch speaking members. Who are the Crystal Skull Explorers? The Crystal Skull Explorers are a group of individuals who are dedicated to sharing the best information about the crystal skulls and working cooperatively together to create new activities and events to help educate the public about the crystal skulls. At the present time we have members in six countries in the world and have decided to to support the creation of ICSN. Of course as stated before, we welcome other organizations to become co-sponsors of ICSN. Again please feel free to contact us via the emails listed before. The Crystal Skull Explorers have existed since 2001 and we have recently expanded our membership in order to better support of our worldwide crystal skull projects that we are actively involved with and this specific network. Rhian Gibbings - The Crystal Priestess - Healer, Spiritual Teacher, Writer, TV Clairvoyant & Crystal Skull Guardian. Danielle Smeijer, Crystal Skull guardian and teacher, Lightworker, Healer for "Mother Earth"